Hedgerow Herbals are concerned about making their products as cost effective as possible too, so that once you have found a product that you like you’ll be able to afford to use it regularly. Hedgerow Herbals rely on the natural properties of traditional herbs to make simply effective products that are a close to nature as possible. Often people with skin disorders find these products much easier to tolerate as simple formulations make it much easier to identify any potential triggers or irritations. 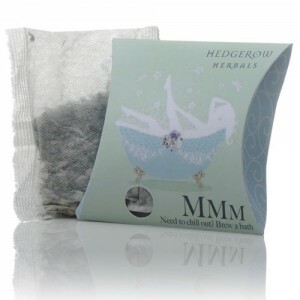 We love the fact that Hedgerow Herbals products are as close to natural as possible, whilst being practical and fun too. The idea of taking a bath using a big tea bag filled with herbs, appeals to our desire to get back to nature, whilst ensuring that our modern bathrooms stay mess free. 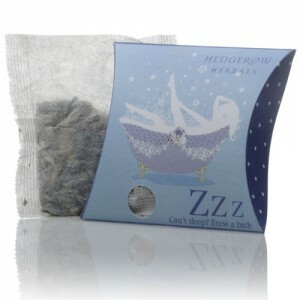 The mood range which includes these tea bags is lots of fun, the idea being that you choose a product to such your mood, with amusing and easy to understand names such as Mmm to help you chill out and Zzz to help those who have trouble sleeping. 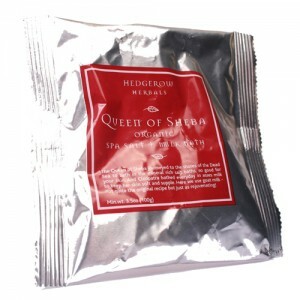 And who could fail to love a product called Queen of Sheba Spa Salt and Bath Milk? This is the perfect indulgent treat for these modern times which prevent us spending anywhere near enough time pampering ourselves! 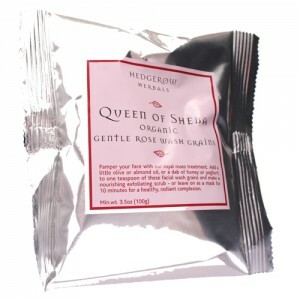 Anyone with a sense of fun, looking for truly natural bath time products to pamper themselves or as a gift will love the Hedgerow Herbals range. Hedgerow Herbals products do not have any independent certification but they do use a lot of organic ingredients and are completely free from parabens or any other synthetic preservatives, sls, mineral oil, synthetic colour or fragrance. Hedgerow Herbals products are all made by hand in the UK, they use only basic machines to help them mix, blend and pack their products and the simple processes employed leave the herbals ingredients as close to their natural state as possible. Soaps are made using a cold process, which uses much less energy than heating and therefore is better for the environment.